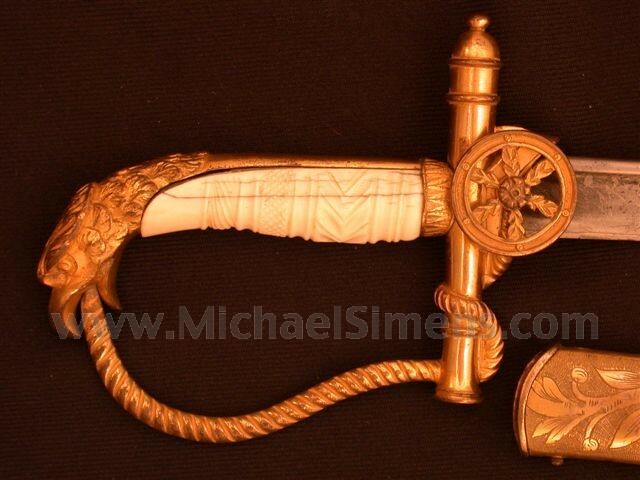 This is a spectacular SPIES Eagle Pommel Artillery Officers sword. 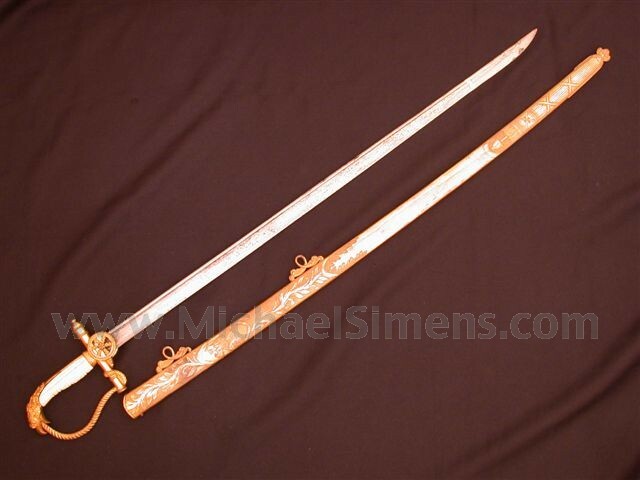 It has a hilt cast in a three dimensional and to-scale cannon tube cross guard with applied three dimensional free spinning wheels which also function as the swords languets. This Eagle pommel sword uses a heavy thick twisted rope for a knuckle bow terminating in the eagles open beak and on the other extremity wraps around the cannon barrel. The grip is of carved ivory, having a feather cast back-strap from the eagle pommel to the guard under a ferrule that is relief cast in a feather design. 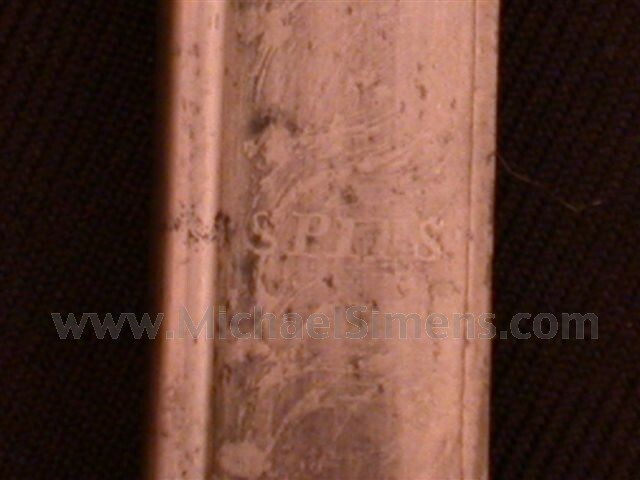 The pipe backed blade is etched SPIES near the ricasso within the blade etching. 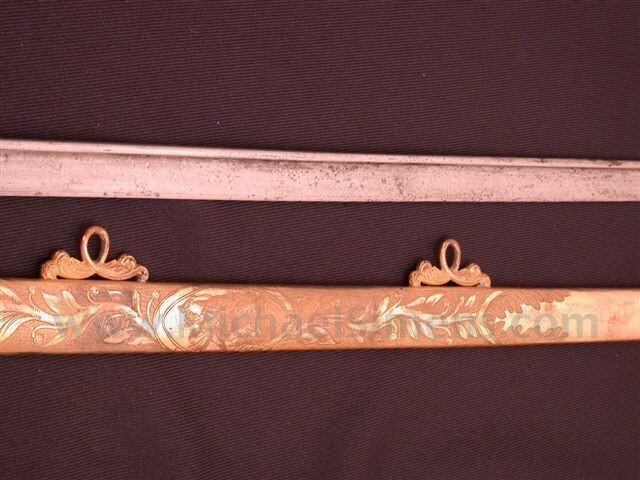 The brass scabbard is engraved in a fine foliate style that utilizes a background stippling style which has the effect of a frosted appearance thereby bringing out the foliated engraving to resemble etching thereby creating a wonderful design. The suspension ring mounts are applied foliate loops while the drag embellishment includes a bundle of arms and liberty cap on a pole with a flower finial for the drag crest. What a very rare and highly desirable sword motif for an artillery officer of the period and for the modern sword collector who wants only the best!